With its near edge-to-edge screen, notch-less top and bezel-less sides, the phone is close to almost just screen. Its 93.8% screen to body ratio makes it the biggest for any smartphone including Apple’s iPhone X. When you first get your hands on the prized gadget, you might ask where the front camera is but that is where things begin to get sophisticated – the motorised top extends and retracts to reveal the camera. The Oppo Find X is definitely a phone built for the future. The Oppo Find X comes with their signature curved glass edges that cut slightly into the metal body. However, it is still a sight to behold. From afar, if you do not pay close enough of attention, you may mistake it for the Samsung S9. However, upon flipping it around and seeing either the striking Royal Blue or Magenta backing, anyone would know that is an Oppo. At 9.6mm, it is definitely one of the thicker phones out there in the market, but its curves and tapers make it easier to pocket. Despite boasting a massive 6.4 inch OLED screen, the 2304 X 1080 pixel sizing means it does not have the highest resolution. Regardless, with nothing obstructing the front screen, the colours still look attractive on playback and does provide an immersive multimedia experience. Another phone on this list to run on the Qualcomm Snapdragon 845 chip and its 8GB RAM, programmes should be running with ease. Packed in with 256GB of internal memory, it might seem like a miss to not be able to add an external microSD card to bolster its capacity. Remember the hidden front and rear camera? 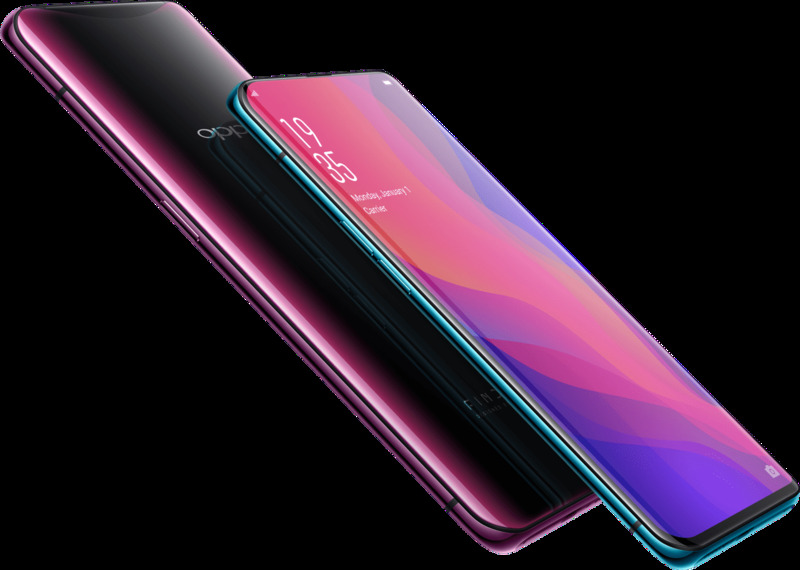 The Oppo Find X is the first phone to have a sliding module to hide the cameras when they are not in use and vice versa. While the Oppo Find X is the first of its kind, there are many separate considerations that come with this feature. What is the activation lifespan of the sliding module? Wouldn’t this retractable feature make the device more prone to water seepage? Would the exposed camera top break off upon impact on the ground? Despite boasting a 23MP front camera and 20MP + 16MP dual rear cameras, both with a f2.0 aperture, the photos were not as impressive as the iPhone X or Google Pixel 2. But knowing the China-based company is mainly targeting the Chinese market, they have cleverly included sticker face filters and beautification settings – a hugely popular feature in the mainland Chinese market. A phone with a beast of an operating platform needs a beast of a battery and thankfully the Oppo Find X comes with a 3730 mAh battery. The chunky juice pack in the Find X should allow it to run for a day and a little more before it needs recharging. The Oppo Find X has definitely come out seeking to shake up the smartphone market among those who use smartphones of the upper echelons like your iPhone X, Galaxy S9 and what not. It has displayed several revolutionary design features including its insane body and screen ratio, and the sliding mechanism for its front and rear camera. However, at $1000, you would expect a smartphone to come with all the latest technologies. With an average camera, a lack of wireless charging despite having a glass back and more absurdly the lack of Near Field Communication, it means you will not be able to use Google Pay on this device. If these shortcomings are not a deterrent, you should be quite excited when the phone is made available in the market.